From 1968 to 1972 my husband and I, along with our three children, lived in Nepal and India. It was in those places that I fell in love with geometric and mosaic designs. The images were everywhere–on buildings, walls, textiles, gardens–and they became ingrained in my whole being. It was also in India in 1972 that I began my first quilt, a mosaic, allover design made of hexagons called Grandmother’s Flower Garden. Three years later, after returning to the States and while visiting my friend, Suzi, I saw a mosaic box on her table and immediately became enamored with the hexagonal design. She let me borrow the box and after days of scrutiny, I started my third quilt, Suzi’s Box. Over the years I have collected mosaic boxes and designs from many countries–Spain, India, Nepal and North Africa. So many of these designs have small narrow borders between the elements of the design. I wanted to tackle one of these types of designs and decided to begin with a simple six-pointed star joined together with diamonds made up of a narrow decorative stripe. The stars were cut from leftover border print pieces. The narrow stripe was taken from one of my border print fabrics. Each of the connecting diamonds was made up of four smaller triangle pieces. Herein lies the problem. I loved the design and what was happening with the connecting diamonds so I calculated how much of the border print fabric I needed…and YIKES!!!! It was 17 yards! So, I decided that since the use of that fabric was too extravagant, I would just have to design a fabric that would work and that was when my first “mini-stripe” fabric was born. That fabric is used in the quilt which inspired its creation, Arabic Tiles, yet another hexagon based design. It was so much fun experimenting and designing quilts using the first mini-stripe fabrics that I included another, in several colors, in my Aruba collection. This brings me to the point of this blog. As you can see, inspiration doesn’t just appear. It is built on experiences, images and just slowly develops. I had been trying to decide for weeks what type of design to use for this year’s BOM quilt and wanted to include the mini-stripe fabric. Then one day when dusting a shelf, I spotted these two plates and looked at them with new eyes. I knew immediately that they would be the inspiration for the new 2019 BOM. I studied and studied how the designs were created and after a week of complete concentration and drawing was able to come up with and draft this design. Thank goodness our pattern writer, Elaine, was a genius in breaking the design down into simple piecing of nothing but straight seams and a few in-set seams. 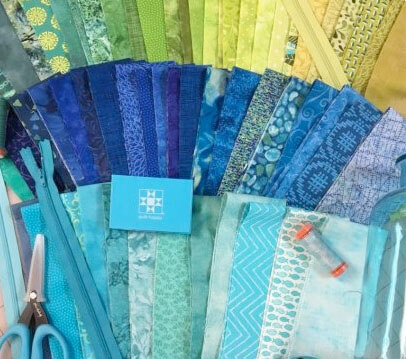 The fun was then in selecting the fabrics and the six different colorways to create the quilt. Links to the first video and printed lesson will appear in our April 6, 2019 newsletter. It is free to all newsletter subscribers. Watch this video clip to learn about the BOM and stay tuned for the next blog and the behind the scenes look at creating the program. Last month, we introduced our latest grand bundle, Protea, named after an amazing flower found in South Africa. As I often do, the colors for this bundle we’re pulled from a photograph the Studio’s manager, Rebecca, took while on a trip there in 2017. If you are interested in this process of capturing colors from a photo, I wrote about it in a blog when we introduced the Irish Heather bundle. There are 40 fabrics in the Protea bundle and we have broken it up into five smaller bundles of eight fabrics each. Once a month we offer one of the smaller bundles as our web special. Whenever we introduce a new bundle, we always discuss possible projects to give you all an idea of how you can use the fabrics. 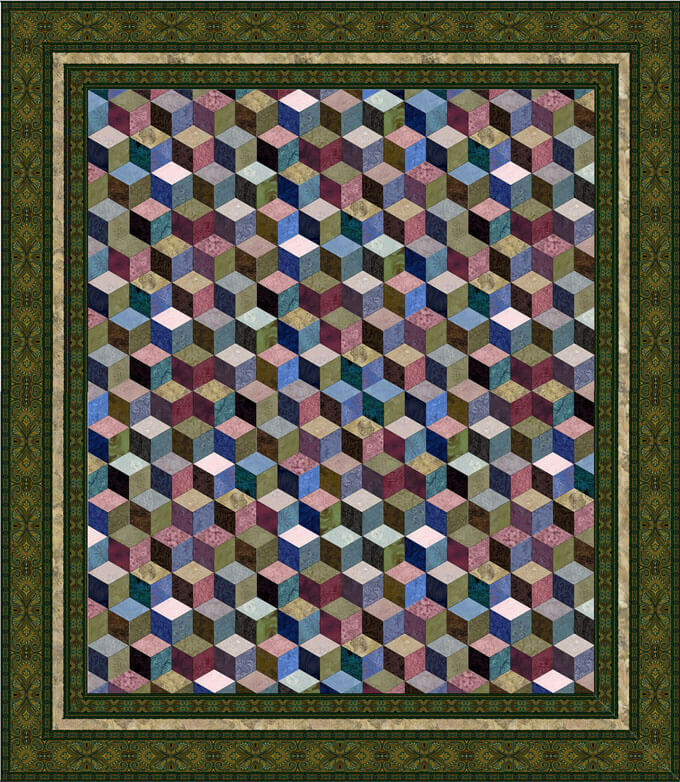 Both the Thousand Pyramid and Tumbling Blocks quilt were shown in the Irish Heather blogs and would be perfect for this bundle as well. 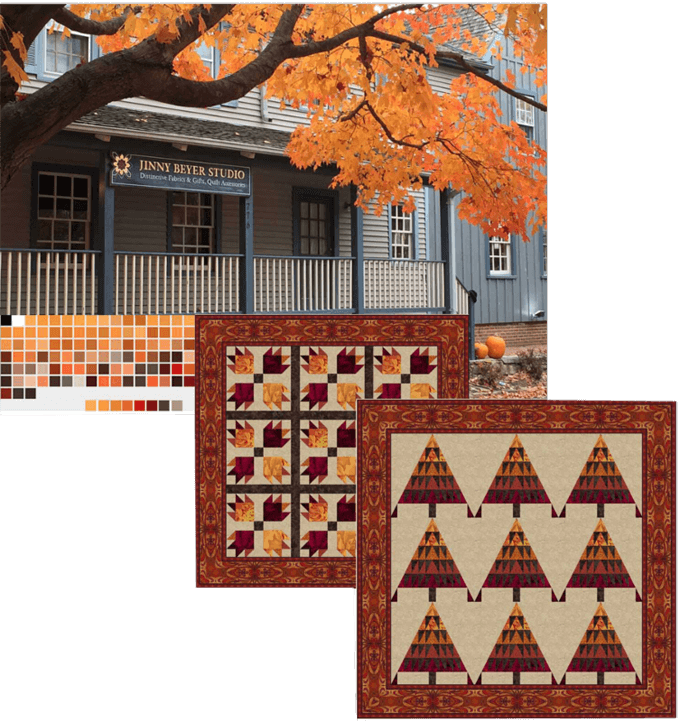 Another suggestion is a quilt, Potomac Charm, designed in 2013 for the Quilters’ Quest shop hop. Potomac Charm used 99 five-inch charm squares so, in order to have enough to play with, we cut two squares from each of the 40 Protea fabrics and staffer Nancy and I started arranging them on the design wall. We decided on a setting of 54 “blocks,” set six across and nine down. Swatches were added, moved around and taken down. Just when we thought we had it set we would change it again. Then we added border prints down the sides to audition them. What do you think? After the positioning of the squares was set I created a digital image and played around with border options. Since the quilt was so small, I chose to start with the narrow border from the Casablanca fabric. The best outer border was just a wider black piece. To determine the best width for that last border I got out my trusty Golden Gauge Calipers. This gave me the perfect size for that last border. If you are not familiar with the Golden Ratio, check out my blog on this topic from a few years ago. I tried another version using the border print from Miyako. The finished quilts are approximately 59” x 67”. We always have people wanting to make our quilts larger. So I decided to play around with the digital image. I removed the top and bottom rows of squares then made two exactly alike and two that were the mirror image. Since the quilt is larger, I used the wider stripe from the fabric and then used the calipers to determine how wide the black should be. Here is the quilt with the two different borders. 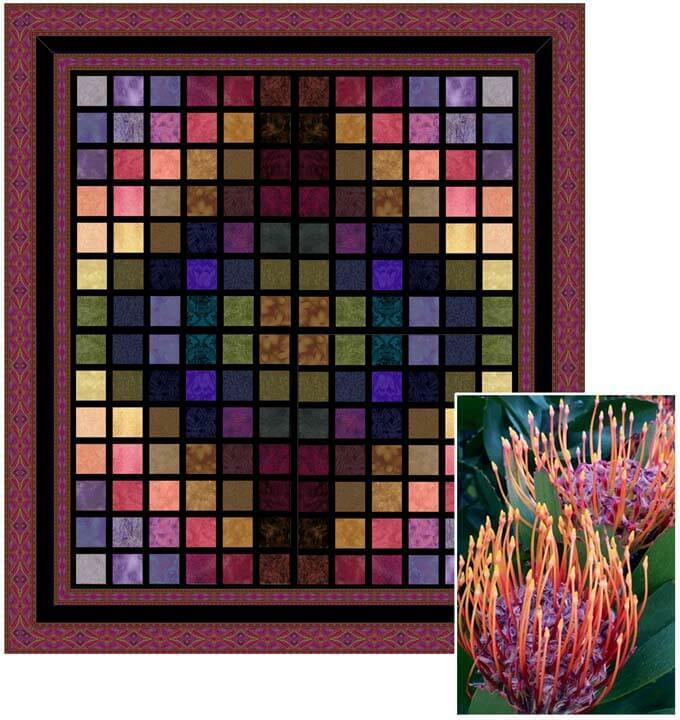 No longer a charm quilt (charm quilts do not duplicate fabrics), we decided to name this Protea Squares. The small quilt measures 34” x 50.5” without the borders and 59” x 67” with the borders. The large quilt is 67” x 78” without the border and 84” x 95” with the borders. The finished width of our smaller quilt outer border is 3 7/8” (cut 4 3/8”). The finished width of the larger quilt outer border is 8½” (cut width 9”). We are giving the Potomac Charms pattern here as a free download. You can use that as a guideline for creating your own 5” square quilt. We encourage you to play with fabric placement and settings, adding more squares or less, (depending on the size you want) or even adding fabrics from your stash. Once you get started, I’m sure you will have as much fun as we did. When bad weather forces us to close the Studio, we spend our day as many of you would—working on our quilting projects. Here’s a quick look at how many of we staffers spent our free day. 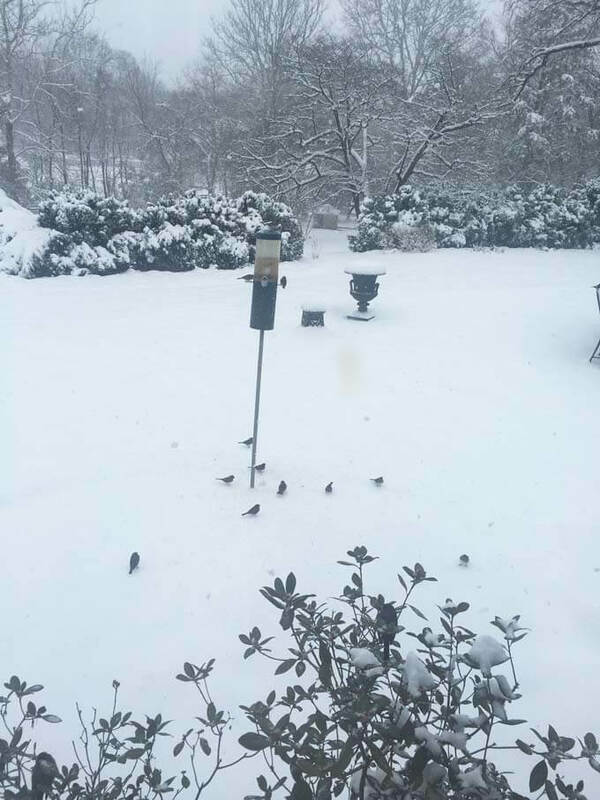 Jinny is currently in the middle of taping the lessons for her new block of the month, Stellaris, so that’s what she worked on all while watching the birds and snow outside her window. Nancy finished up the machine quilting on one quilt and continued hand quilting with a “big stitch” on a Quest quilt from 2013. J.J. visited her brother in Utah last fall and discovered a BOM called Sewology from American Quilting, a quilt shop in Orem. Here is a photo of the beginning of hers along with her cat, Buckeye. Can you guess that J.J. is from Ohio? For Linda, it was a day of catching up with projects. Putting binding on a class sample, labels on recently finished quilts, the next block in the Moon Glow staff challenge (more on that in another blog) and continuing to hand piece 9-patches for Jack’s Chain quilt is how she spent her day. The lighting is perfect in the sunroom on a snow day! Maria is at Bethany Beach with five quilting friends. (Aren’t we jealous!) With wonderful company and food, she is working on the appliqué part of her Jen Kingwell “Golden Days“ quilt. With two new grandsons born 3 weeks apart, Lura is hard at work on baby quilts. On the left of each quilt are possible backings. Julia quilted a baby quilt for an Operation Homefront baby shower. Judy summed it up when she said, “So it’s amazing how much you can do without interruptions.” She worked on the Moon Glow blocks and put together the blocks for a charity quilt. She also finished up the machine appliqué on a BOM border and put on the last border so it’s ready for quilting. Wow, she did accomplish a lot. And finally, Rebecca started the day with a little hand quilting on her Facets quilt then headed to the airport to catch a flight to Nashville and the QuiltCon quilt show. We know she made it as far as the gate and hope she got out. Whether it is snowy like here in the DC area or warm and sunny where you are, everyone should take a “snow day” every now and then. Here it is almost the beginning of winter and fall seems like a blur. It seems I was on a treadmill and didn’t know when to get off. We had our anniversary sale, followed by some classes, then our 10-day shop hop, followed by a trip to Quilt Market in Houston and as soon as I got back from that turned around and went to visit my grandchildren (and their parents) on the other side of the country! Back home a few days ago, I am now in the throes of preparations for my most favorite holiday of the year, Thanksgiving. No one worries about presents, cards, or the pressures of the December holidays……just good food, family and camaraderie. In the spirit of Thanksgiving, I want to share with you my recipe for stuffing. Years ago, I started with the basic bread, onion and celery stuffing and kept changing it little by little. Here is how I have been making it over the last several years. In a large kettle, melt the Smart Balance and add the celery and onions. Stir and cook until celery is tender. In a separate skillet, cut the sausage into chunks and cook until crumbly. Add all ingredients to the onion/celery kettle and mix well. Taste for seasoning and add extra seasonings as necessary. Stuff the turkey cavities just before roasting. Put any leftovers in an oven proof dish, dot with more Smart Balance, cover and bake the last two hours of roasting the turkey. 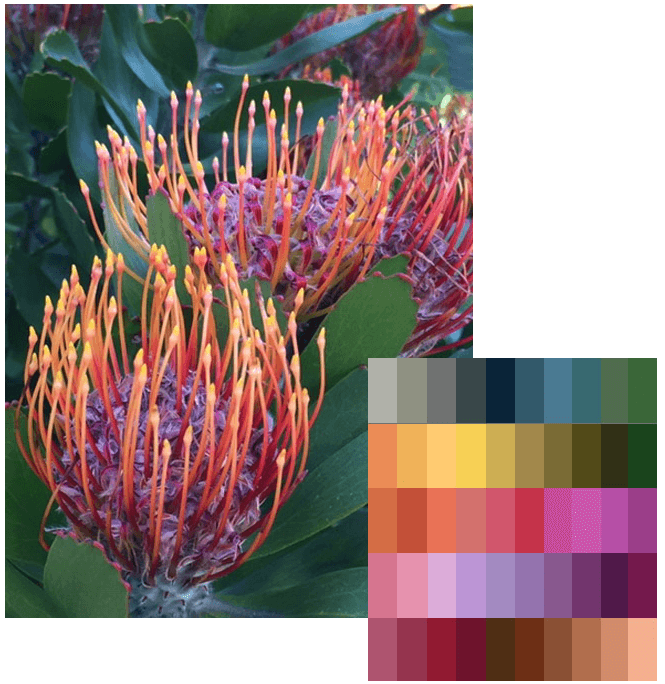 Last month I wrote a blog post on getting color inspiration from a photograph. I gathered fabrics that matched those colors and created the Irish Heather grand bundle of 45 different fabrics. 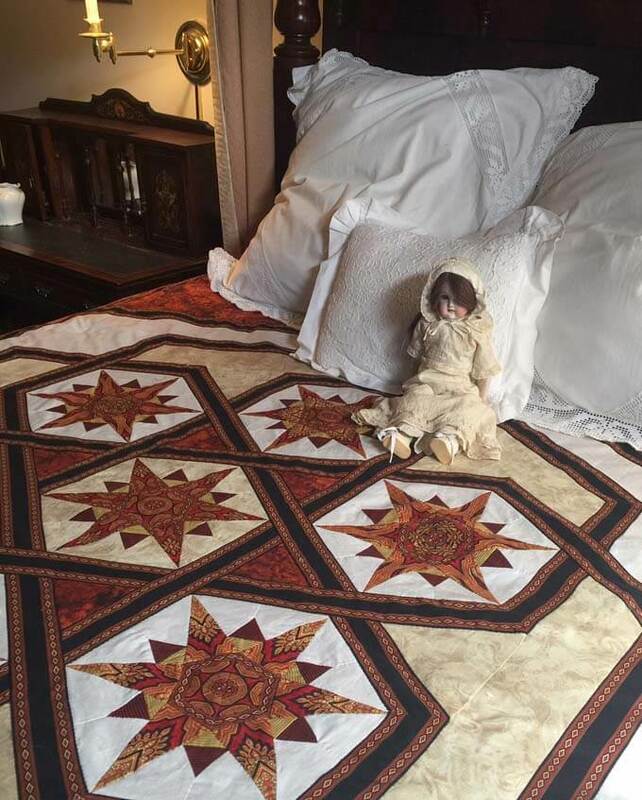 I showed a quilt I created from those fabrics and arranged triangles in the traditional Thousand Pyramids style. So you have the bundle of 45 fabrics, you have the design, but the question arises about how to get a good distribution of the colors and that is what I want to talk about this week. Any time I do a quilt like this, I like to work in “units.” It is easier to get a good distribution of the colors from a smaller unit than it is to try and visualize the entire quilt. 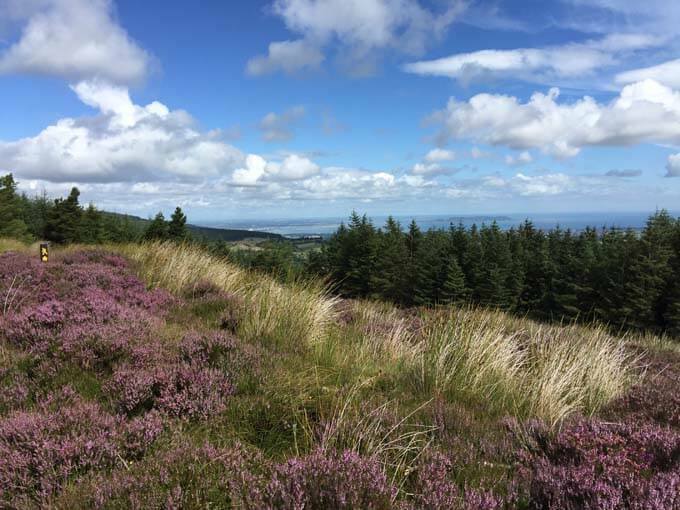 Check out the first Irish Heather blog on how these colors came about. For this quilt I had two units (A and B). The black and white sketch shows that in A the dark triangles are pointing upward and are across the bottom of the triangle. In B, the lights are across the bottom and pointing upward. To create the quilt, these two units are alternated with Unit B turned 180 degrees. Half units fill in the sides. Please note that in the above illustrations, all the darks are very dark and all the lights are very light. There is a lot more interest if some of the darks are lighter and some of the lights are darker. Any light triangle only has to be lighter than all the dark ones surrounding it and likewise any dark triangle only has to be darker than all the light ones surrounding it. Compare the difference between the illustrations above and the one below. The next task was to create those units in fabric. Each unit has 25 fabrics—15 darks and 10 lights for Unit A and 15 lights and 10 darks for Unit B. In each one I tried to get a good balance of all the colors in the bundle as well as a good balance between values from light to dark. When I put several of the units together I wasn’t sure I was getting the colors the way I wanted them. Comparing what I had to the photo I realized I needed more of the pinks and blues and less of some of the other colors. So I made two additional units (C and D). For these units I had more of the blues and pinks. And then in the final quilt I alternated all four units. While I made this quilt digitally with only the fabrics from the Irish Heather grand bundle, if I were doing it in actual fabric I would add many more fabrics from my stash that fall within the same range of colors. My philosophy is the more fabrics the better. In fact, this particular design was a favorite one to use when making a charm quilt…a type of quilt popular from the late 1800’s to early 1900…but that is a whole other story to pursue in future blog posts. Why not give this quilt a try? Here are the two templates that I used in creating the quilt shown here. In addition to the templates, you will also find yardage requirements for the borders and some basic instructions. I hope you have fun with it. Look for additional Irish Heather bundles in upcoming Weekly Web Specials. Last month, I shared with you the beginning design process for our Quilters’ Quest Shop Hop quilt for this year. I designed the quilt in black and white and decided upon two different shaded units made from 60° diamonds. The next step in the design process was to sort through the 2 ½’ strips that were collected from each shop. First, I separated them by color. In the sorting process I discovered a few fabrics among the strips that had too much contrast, which would make the shading difficult. In all, I took out nine strips and set them aside for the small quilt I plan to make with leftover pieces. The next step was to arrange them in a somewhat shaded order. I would need five different fabrics for each diamond. In total, there are nine diamonds in each shaded unit, but for continuity I repeated the same fabric for the rows that have more than one diamond. (See black and white image above.) In other words, one fabric for the first row, two the same for the second, three the same for the third, then two of the same for the fourth and one for the fifth. Next, using my 60° Perfect Cut Diamond Ruler and the companion 2½” diamond template, I cut each of the shaded strips into 12 diamonds. I saved the leftover bits from the strips for later to use for cutting edge pieces. Once all the diamonds were cut, I arranged them in shaded groups of five or more fabrics. I like to have more than five so I can use this same grouping for different completed units. It makes the shading process easier. In other words, for this particular grouping here I have eight different fabrics that not only shade from light to dark, but more importantly they also shade “through” colors. A group of all blues or all yellows or all teals is not as interesting as ones that contain more colors. You need to look for “blender” colors that help you get from one color to another. For this particular group of diamonds, I can get four distinctly different shaded units. Fabrics 1-5 form one group, 2-6 form another, 3-7 another and finally 4-8 form the last. Notice how different the first and last groups are. This is the way you should proceed with all your diamond groupings. That way you have some lighter than others, some darker, some brighter and so forth. A quilt like this is a great hand piecing project. In mid-May, I arranged several diamond units, some shaded lengthwise and some shaded sideways, and put them in my luggage and headed off to Quilt Market in Portland. I spent a few days after Market with my daughter and her family and by the time I had two five-hour plane trips and several hours of downtime while the kids were in school and their parents working, I was able to hand piece more than 40 of the 65 diamond units I needed for the quilt. Here are just a few of them. Next time I will tell you about making larger units from the smaller ones already completed. We often receive questions and comments from quilters about a wide range of topics and often those questions will pertain to a wider audience and seem a good topic for a blog. While I do have two classes coming up at the Studio next week, including Hand Quilting, I certainly understand that our website reaches quilters around the world and most of you will never be able to visit the Studio. This was one of the reasons that I began my mystery quilt series and include video lessons with them. We do currently have classes based on our mystery quilts both last year and this year. 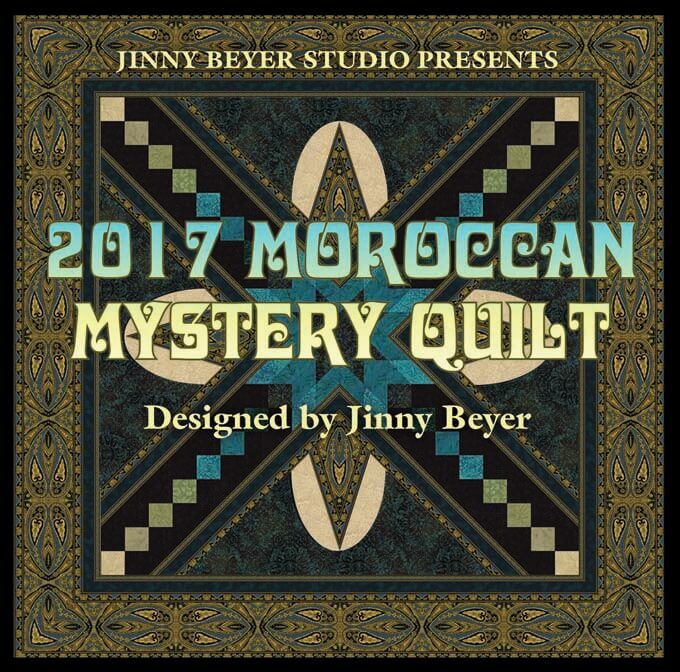 Our mystery quilt lessons are free to subscribers of our newsletters during the length of the class. Each newsletter has the link both to the written pattern and to the video lessons. The classes cover a wide variety of techniques that I teach, including hand and machine piecing with topics such as sewing curves, joining odd angles, applique, foundation piecing, etc. We also discuss color, quilting, using borders prints and more. Once the year is up and we go on to the next project, the previous year’s quilt pattern and videos are available for sale. Currently, last year’s project, which covers a wide variety of techniques, is available for sale as a pattern and DVD. That project is Moroccan Mystery. The current year’s project is Kyoto Mystery. Those patterns and video lessons are free if you are a subscriber to our newsletter. Even if you start now, in each newsletter, there are links to the previous months’ lessons and videos. Kits are available for both of these quilt projects, but even if you do not want to make the quilt, the video lessons are valuable on their own as they cover many of the techniques that I cover in my classes. Our web site also has many free videos and quilt tips on a wide variety of subjects. Click here to visit our “Tips and Lessons “page.